How to change stroke width of image made by drawing in iPad? I have a drawing using Adobe Ideas app in iPad, then export it to PDF to open it with Inkscape. It is a vector image since I can enlarge it as much as I want. However the width of the stroke too big when I enlarge so I want to reduce it. When I double click on it, the result appears as the picture below and I don't know how to resize it. Do you know how to achieve my purpose? Thank you. Beside Inkscape, I can use Illustrator. 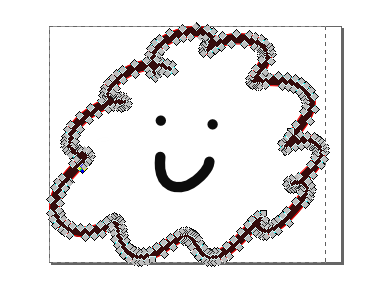 When you double click on a path in Inkscape, you enter in node editing mode and you can edit the path. 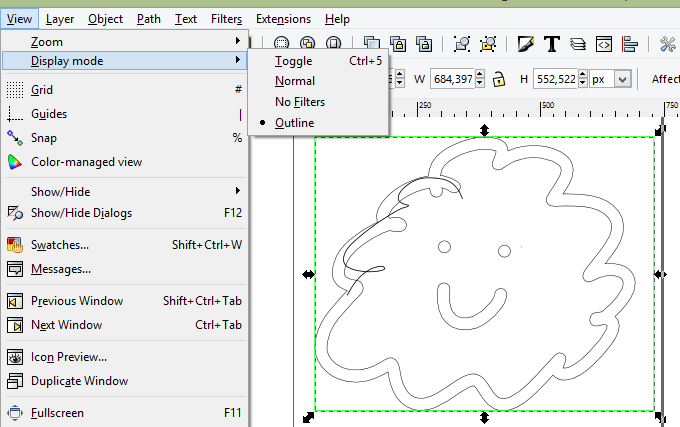 In select mode you can resize or rotate your shape. You can change the stroke attributes using the button on the top toolbar. 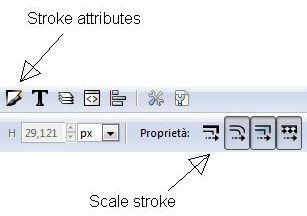 The behaviour of the stroke while resizing depends from the status of the buttons on the top toolbar (see above and give a look here). Let's return to Normal mode. Select the object and ungroup it by clicking Shift-Ctrl-G until you got a message of no more groups to ungroup. 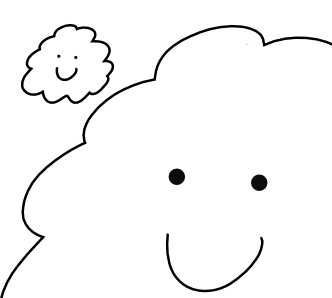 As you see, in this way you have evidence that the "cloud" is not a path with a heavy stroke, but is a composition of an internal and an external path. 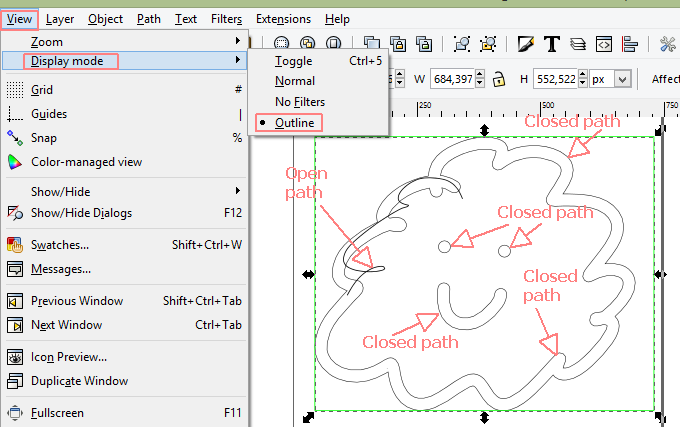 Now, delete one of the paths (the internal, in my example) and change stroke and fill as desired. A similar operation should be made on the mouth (you can cut the path and keep an open path). And perhaps to the eyes. 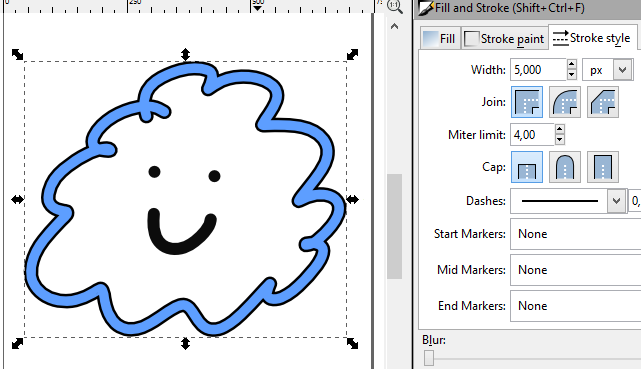 In my opinion, such an operation (doodle with a tablet, export and import in a vector graphics editing program) is possible, but you need a bit of work to adapt the result to your specific needs. It could be simpler if you have in advance an idea of the desired result: you can choose the proper tool from the beginning. 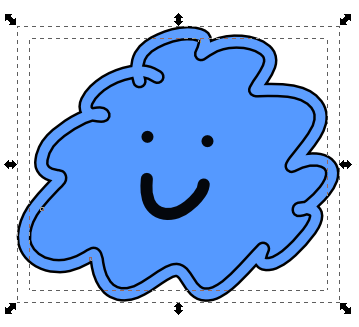 Adobe Ideas essentially uses the Blob Brush to draw. This means it expands artwork and nothing remains as a stroke. Everything becomes a shape. An easy way to reduce the width of a shape, especially in a black and white image, is to add a white stroke to the shape. Then select the shape and choose Object > Expand. And lastly, select the white shapes and delete them. Not the answer you're looking for? Browse other questions tagged adobe-illustrator inkscape stroke ipad or ask your own question. How can I modify the width of only the last segment of a path? Path to stroke, is it possible? How to work similar colours of an image using Inkscape?